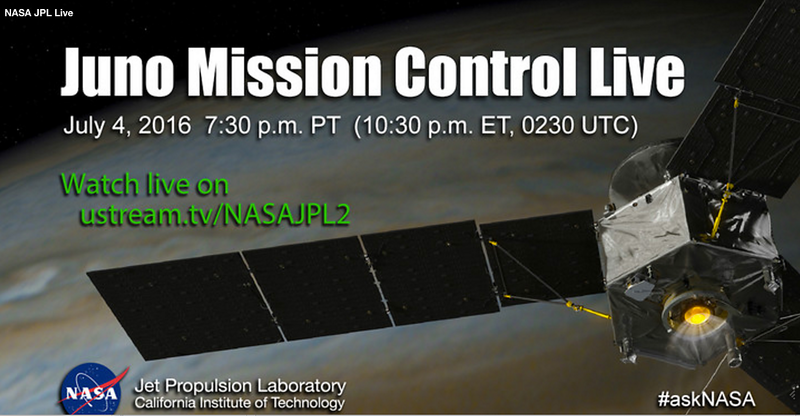 Tonight at 7:30PM PT on USTREAM, you can watch Juno's insertion into the Jupiter Polar Orbit. From a unique polar orbit, Juno will repeatedly dive between the planet and its intense belts of charged particle radiation, coming only about 3,000 miles (5,000 kilometers) from the cloud tops at closest approach. From NASA's website, Juno's primary goal is to improve our understanding of Jupiter's formation and evolution. The spacecraft will investigate the planet's origins, interior structure, deep atmosphere and magnetosphere. Juno's study of Jupiter will help us to understand the history of our own solar system and provide new insight into how planetary systems form and develop in our galaxy and beyond.